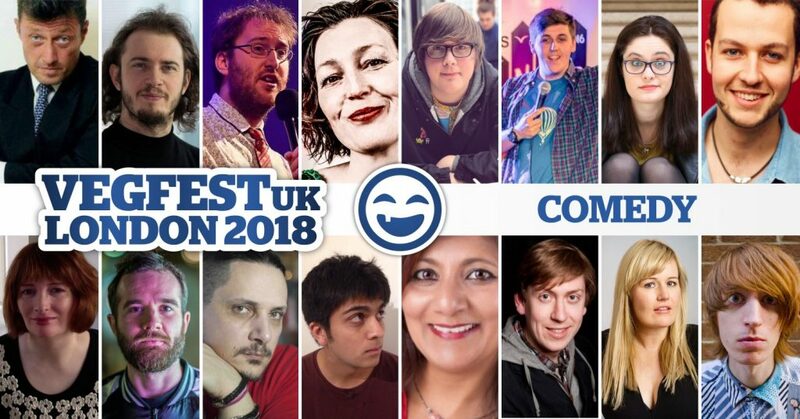 Standup comedy is back at one of the UK’s leading vegan festivals VegfestUK on October 27-28 at Olympia London! This popular feature, which saw its inception 6 years ago back at the Brighton edition of Vegfest, welcomes a vibrant and dynamic mix of comedians who are not only very good at telling jokes of course, but are also 100% vegan themselves. Ranging from the established to the up-and-coming, and possessing a mixture of unique talents in absorbing storytelling, killer punchlines and improvisations from their own life experiences, these comedians will get everybody’s spirits sky-high with their both nonchalant and pre-meditated jokes. All of them being vegan, of course, they know a thing or two about the quirks and travails of living with pre-vegan family members, friends or co-workers, and obviously, they will also share their own personal stories about living the vegan way amongst many other life anecdotes. The comedy sessions are kindly hosted by vegan comic and compere Mike Kelson. Headlining the Saturday part of the comedy zone is mental health and eating disorder campaigner Dave Chawner. Seen on BBC, ITV & Channel 4, Dave is also the award-winning author of Weight Expectations, a book on his own experience of anorexia & eating disorders. Dave has been a regular at VegfestUK events since London last year and he is looking forward to his return this October. Adele Cliff: Writer of one of Dave’s Funniest Jokes of the Edinburgh Fringe in both 2016 & 2017, Adele is a regular at clubs across the UK and has gigged at top venues in Chicago and New York. Her interests include falafel and trampolines. Matt Hoss: Matt’s comic styling revolves around self-deprecation whilst also being delightfully playful. He approaches anecdotes with severe honesty about his family, his love-life and his embarrassing secrets. Matt’s first hour-long show, Vegetari-Man, was about telling his northern beef-farming family that he was vegan. His new show, 100 Acts Of Morality, discusses veganism further. Luke Poulton: Luke is a comedian who tells stories about living with Autism and jokes about crap movies that no one else wants to watch like “Snakes on a Train“. Awful at making eye contact with the audience but is trying his best to and finds a way to self-deprecate on problems he’s had in life and jokes about things no one else cares to talk about. Sami Stone: Sami fell into comedy through her work as a storyteller in schools & literature festivals in the UK and overseas, learning that humour is universal. As a standup of 10 years, her work is largely autobiographical, peppered with some social commentary. Sean Morley: Top lad Sean is back with some of his biggest best jokes, really ready to smash the gig, raise the roof, raze the venue and salt the Earth. Fully intending to apply himself utterly and apply pressure on the show from above and within. James Cartwright: Rather than just seeking to inflate his ego, James mostly got into comedy to make people laugh with vegans, rather than at them, and examine social taboos from fresh, egalitarian perspectives (even if that means tearing himself down in the process). Bringing the standup on the weekend to a climax is quick-witted comic Ryan Dalton, whose cheeky and sometimes naughty stories are performed with an aggressive charm. Ryan brings his frustrations to the audience, whether it be a story of an uncomfortable hangover in St Lucia or tales of the tricky guests during his time working as a zookeeper, he tells his stories with the pent-up anger of a criminal yet the voice of an angel. Sarah Bennetto: Expect killer stand-up, storytelling and characters from this Melbourne-born, London-based comedian. Her past solo comedy shows include: a sitcom about office temping, the true story of having lunch with Prince Charles at the Palace, a hour-long ode to boardgames and Victorian parlour games, a study of her unbelievably good luck (she’s won a car, holidays, the lottery), staging her own funeral live, and this year: every mistake she’s ever made, presented in list form. Ishi Khan-Jackson is a happy stand-up comedian. Her bubbly & charming stage presence puts you at ease immediately. She invites you into her complex world of a being born in Zambia, dreaming in Shakespeare and an Indian Heritage. Her energetic, playful nature draws you in. Expect silliness, colourful Bollywood dancing, infectious laughter yoga and hilarity! Jamie D’Souza started stand up in the summer of 2015. His performances are a mix of dead-pan ranting with a high hit rate of punchlines, with the occasional song thrown in for good measure, guaranteed to get the audience laughing. Kahn Johnson has a cat, MS, a girlfriend and a hatred of Trump. Sometimes these things get talked about on stage. Other times he goes for the easy option and talks about being vegan… When he’s not on stage, he runs www.sleazyvegan.co.uk, www.unsaltedpopcorn.blogspot.co.uk or sleeps. Unsweetened soya milk, as you ask. No sugar. But cake. Always cake. Adrian Nicolae George is a comedian, improviser, author, and a few other things, and he’s preponderantly dark in theme and humour. He has also been called a “nutter”. Not sure if that’s good or bad. Oh, and he’s a Romanian, so he took your spot, too. Laura King is the offspring of 1970s militant vegan parents who believed a combination of Montessori home schooling, the vegan diet, atheism and anti-vaccination slide shows would produce a nobel prize winning genius. They are still waiting… Meanwhile Laura has just come out as a celebrity-trapped-in-a-nobody, but frantically saving for trans status reassignment surgery. Full timetable and biographies of all comedians on show are available on this page here. Advance tickets are now on sale at www.london.vegfest.co.uk/tickets with special offers (BUY ONE GET FREE and BUY ONE GET ONE HALF PRICE) running for limited periods only.